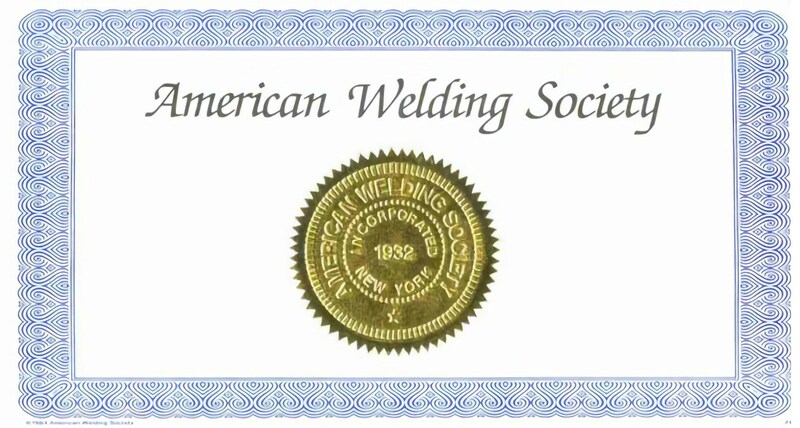 The American Welding Society (AWS) offers a fairly extensive selection of professional certifications, including their valuable Certified Welder program. If you’re interested in a career within the welding industry, an AWS certification is an excellent way to prove the knowledge that you have gained through vocational training at an accredited welding school. The Certified Welder program offers an introductory certification for those who are just entering the field of welding. AWS certification is obtained through a rigorous testing process that ensures that welders have the knowledge necessary to meet industry and employer standards. In the case of the Certified Welder program, AWS testing facilities “can test welders to AWS Standard Welding Procedures (SWPSs), industry standard specifications, and company-supplied or non-code welding specifications.” This allows individuals to test specifically to more stringent codes that an employer may be following or to the more general welding standards. The process of certification itself is held at an accredited testing facility and involves a hands-on practical test that will be graded by a proctor. Getting AWS certified demonstrates that a welder has the knowledge of a broad spectrum of welding procedures. In addition to the Certified Welder program and Certified Welding Engineer program, there are a few other major welding certification programs. Getting additional certifications can help lead to advancement within the field of welding. Preparing for an AWS certification is most commonly done by getting an associated degree or experience within the field, but the Certified Welder program does not require that the welder have any prior education or experience. Some vocational schools, like Tulsa Welding School, offer welder training which prepare students specifically for the Certified Welder program. Welders should be able to identify the correct materials to use, follow standard safety protocols, set up and use a welding machine, prepare the relevant joints to be welded, correctly position themselves to work on the weld and adhere to each welding procedure specification. Once welders have demonstrated their ability to perform specified welds, an AWS test supervisor will inspect and grade the work. If it meets AWS standards, the welders will receive certification. Employers often prefer to hire welders with AWS certification, as it helps ensure that employees are adhering to national standards of quality, performance and safety. Hiring welders with AWS certification may also allow employers to avoid costly on-the-job training. In some cases, a certified welder may receive higher pay or gets reimbursed for the expense of AWS certification by employers. As a performance-based test, the AWS Certified Welder program is particularly valuable to individuals who have just entered into the industry. This certification shows prospective employers that welders have the knowledge to complete procedures up to code and to specification. Tulsa Welding School (TWS) prepares its students specifically for this test, as well as offers career services upon graduation. To learn more about welding programs offered, contact TWS today.